Ethelred I was born around 834 and like his father Ethelwulf, was a man of great piety, nd had been brought up very religiously by his mother, Queen Osburh. Ethelred succeeded his brother Ethelbert in 866 to a land that was being ravaged mercilessly by the full fury of savage Viking onslaughts. The Danes were beginning to settle in England and in 870 siezed control of York. Ethelred took up the struggle against them with renewed vigour. The dynastic ties which allied the House of Wessex to that of Mercia were strengthened. Burghred, King of Mercia had married Ethelswitha, the daughter of Ethelwulf of Wessex. Ethelred's younger brother, Alfred, renewed the bond of alliance when he took his first cousin, Elswitha of Mercia, to be his wife. Ethelred himself married Wulfrida around two years after his accession to the throne of Wessex, they produced two sons Ethelwald, who was born around 868 and Ethelhelm, whose date of birth is unknown. In the year prior to Ethelred's accession, a large Viking army had landed in East Anglia, under the leadership of Halfdan Ragnarsson and Ivar the Boneless. After a few months it marched up to Northumbria, taking the city of York, the Norse Saga's relate that the Vikings exacted a terrible vengeance on Aelle, the Northumbrian leader, who suffered a horrific death at their hands, as revenge for his issuing the order to throw the Viking chieftain, Ragnar Lothbrok into a pit of adders some twenty years previously. Ragnar's sons, Ivar the Boneless, Halfdane and Hingwar, subjected Aelle to the Viking form of execution known as the spreadeagle, or bloodeagle, whereby the victim was pinned face down on the ground and his ribs separated from his spine. The ribs were then forced outwards, forming a pair of wings. The Danes set up their own ruler in Northumbria, before crossing the border into Mercia, advancing into the province and taking the town of Nottingham. King Burghred of Mercia requested aid from his kinsmen, Ethelred and Alfred. They responded with alacrity, marching into Mercia at the head of an army, but the Danes retained possession of the town. In 869 the seemingly unstoppable Viking army advanced into East Anglia. The sub-king of the province, Edmund, opposed them valiantly but the East Anglians were defeated and their King taken prisoner whilst fleeing to the town of Hoxne, in Suffolk. Chained and manacled, Edmund was murdered in a ferocious and barbarous fashion, believed to have been sacrificed to the Viking god, Odin. He met his end with dignity and courage and was later canonized for remaining steadfast in his Catholic faith. Monasteries were raised to the ground, monks slaughtered and plundering took place on a massive scale. By 870, the Vikings, spurred on by their success in Northumbria, prepared to attack the kingdom of Wessex. They were met by a force of Saxons under Ethelred and Alfred at the Battle of Ashdown, the Saxon army blocking the ancient road across the Berkshire downs by an Iron Age hill fort on Whitehorse Hill, at a spot known to the Saxons as Nachededorne or the naked thorn. The Anglo-Saxon Chronicle, our chief source of information on the period, refers to the spot as Ashdown. Ethelred finally won victory over the Vikings in a bitter and bloody pitched battle which lasted until nightfall, leaving many of the bodies of the Danish leaders littering the battlefield. For many centuries it was thought that the 325 feet long White Horse was cut in the hillside to commemorate Ethelred's great victory, but it is now known to be much older. This victory brought no permanent advantage, however, and the conflict continued. The Viking invaders descended again, skirmishing continued and an inconclusive battle was fought at Basing. Ethelred, supported loyally by his brother Alfred, refused to surrender. The raven banner of the Vikings and the dragon of Wessex were hoisted again at Meredune, which is believed to have been either Marden, near Devizes or Martin in Hampshire. In the furious conflict that ensued, the Danes emerged the victors. Ethelred died shortly after at Wimborne, from wounds sustained in the battle, according to one account he died in agony. He was no older than thirty at his death and was buried at nearby Wimborne Minster. Ethelred was posthumously refuted as a saint. 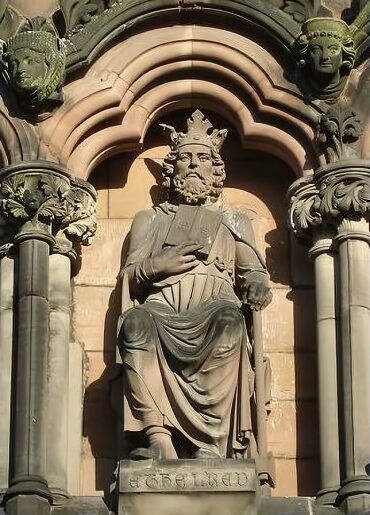 Although he left two sons he was succeeded by his youngest brother, Alfred known to history as Alfred the Great. 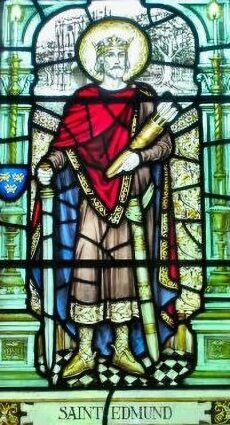 His descendants were again to occupy the throne in the eleventh century, Harold II, who ascended the throne in 1066 and was killed at Hastings, was the grandson of Wulfnoth Cild, thegn of Sussex, who himself was the 2 greats grandson of Ethelred's son, Aethelhelm.